Below are some examples of work that I have done for clients. Feel free to take a look around each site to get an idea of what I can do for you. Home4Schools was created by two teachers. 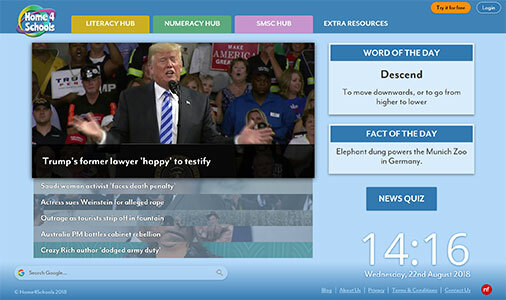 It allows students to get a brief overview of the world news headlines, along with providing a word of the day and a fact of the day. It also provides schools with literacy, numeracy and SMSC activities for use during form time. Each school has a username and password which allows them to login and view this content. AED Rollers have been designing and manufacturing conveyor rollers since 1996, when they were known as Adept Engineering & Design. 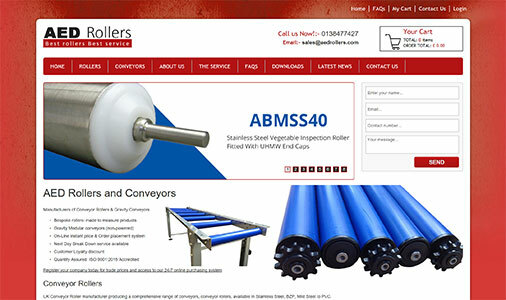 Their website allows customers to order rollers and conveyors. Each roller has many options for the user to choose from such as diameter, axle diameter, spindle type, spindle dimensions and roller length. This is all configured in an easy to use, step by step process when adding a roller to the basket. 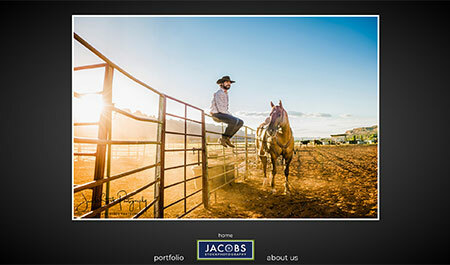 This website is for a stock photography company who wanted their old Flash website recreated in HTML5 to enable it to work in modern browsers. It's a very simple and clean looking website with smooth, slick animations to give a nice fluid user experience. Functionality wise, it is also very simple with a basic photo gallery and contact details. This is a simple ecommerce Magento website that has only a couple of products available in different colours. 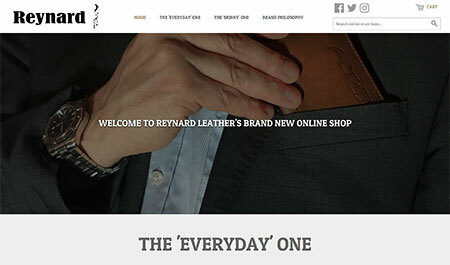 Reynard Leather is a small company focussed on producing good quality leather wallets and so the design reflects that of quality and simplicity. 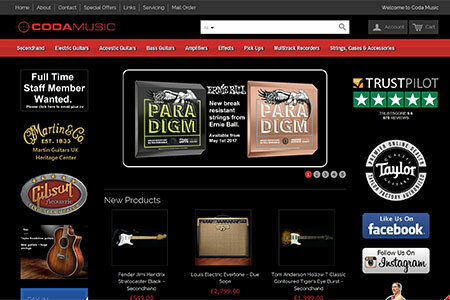 Since 1986 Coda Music have been selling, buying, importing, exporting, repairing and setting up guitars. I developed their new ecommerce website with Magento. It is a huge site with thousands of products and thousands of users. They continually add new products to the site and receive lots of orders everyday. 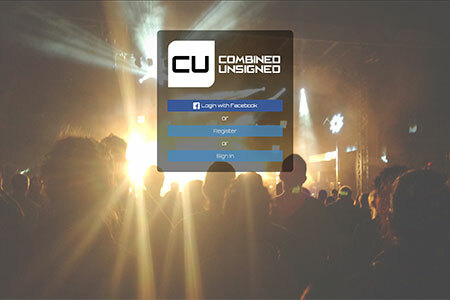 Combined Unsigned is a social networking site for musicians and producers. It requires users to sign in, and allows them to post updates, music, photos and videos. Users can also communicate with each other via comments and private messages. It is designed to be as simple and easy to use as possible with a clean user friendly layout. 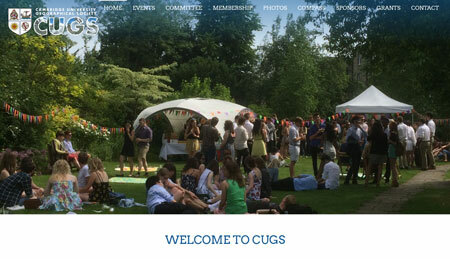 The Cambridge University Geographical Society (CUGS) is the student-run society for Geography students at the University of Cambridge. They put on a number of events and socials during the year for all their members including the Christmas Dinner, Garden Party and various speaker events. Their website lists all upcoming and past events as well as information on the committee, membership and sponsors. The site also has a photo gallery and the latest issue of their own magazine called "Compass". 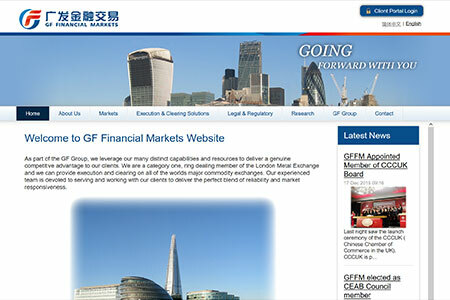 GF Financial Markets is a derivatives broker based in London providing execution and clearing services across a wide range of international markets. I developed a basic promotional website for the company, which went live in February 2014. This was then followed by a Client Portal application, built as an extension of the website. This portal enables clients to log in and track their positions and accounts. 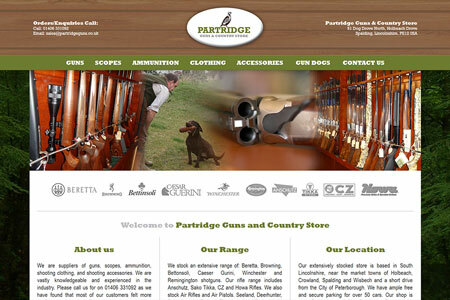 Partridge Guns are suppliers of guns, scopes, ammunition, shooting clothing, and shooting accessories. This is a simple, but large website as it lists their full stock of products; You can browse through categories and view what they currently have in stock. They sell both new and used items. It's not possible to buy online, customers must call or visit to buy goods from them. They also offer a gun dog training service so they required a page on the site for people to read about that and view pictures of dogs being trained in the past. 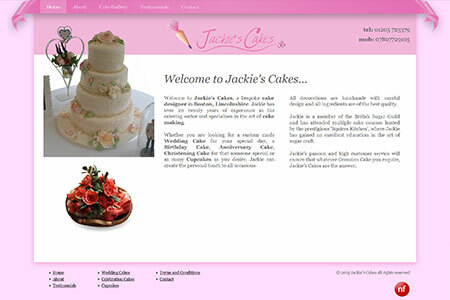 Jackie is a bespoke cake designer in Boston, Lincolnshire. She has over 20 twenty years of experience in the catering sector and specialises in the art of cake making. Whether you are looking for a custom made Wedding Cake for your special day, a Birthday Cake, Anniversary Cake, Christening Cake for that someone special or as many Cupcakes as you desire. This is a fully featured ecommerce online shop built in Magento. 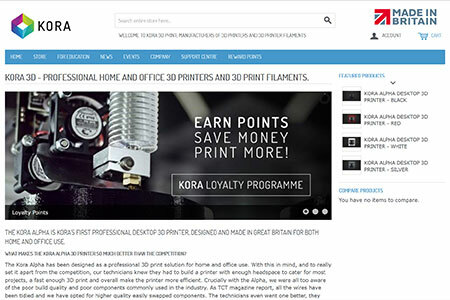 The site is selling a 3D printer and accessories. Some of the features on the site include a scrolling promotional image on the home page, the ability to browse products through categories and filters, a customer signup/login system, reward points for people who purchase items, plus more. The design is a custom built Magento theme that I created for this website. 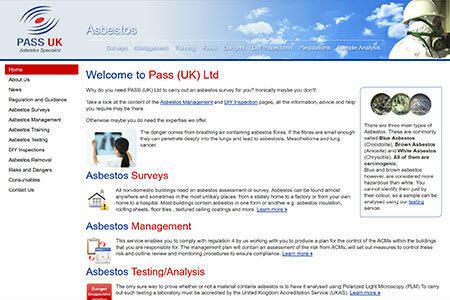 Pass UK are asbestos specialists who can carry out asbestos surveys and testing. The website is a fairly simple site with many pages. It includes several forms that users can fill out to contact Pass UK if they are in need of their services. There are also some PayPal buttons which allow users to purchase an analysis of samples; these are only simple PayPal buttons though, there is no shopping basket involved. 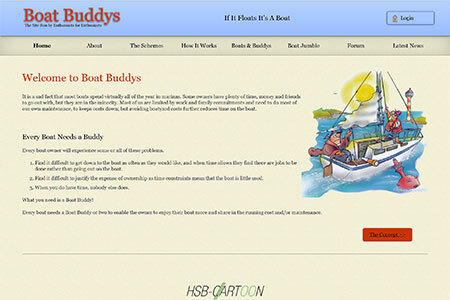 Boat Buddys is a site that allows owners of boats to advertise positions for other boat enthusiasts to team up. You can advertise yourself as a boat owner, or a boat buddy. Also, there is a boat jumble, which allows people to place adverts for any parts they may need for their boats. There is also a forum for boat enthusiasts to discuss their thoughts with each other. 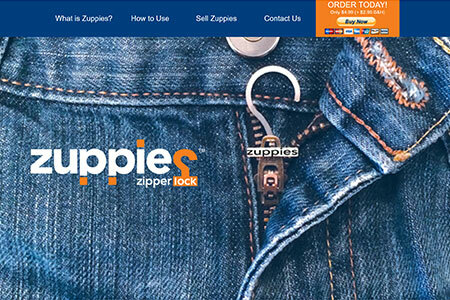 Zuppies are a small hook which keep your trouser zip up. The site is only a single page site, but it includes several sections that can be either scrolled to or the user can click on a button at the top and the page will automatically scroll to the relevant section. There is also a PayPal button that, when clicked, will take the user through to PayPal where they can purchase the product. 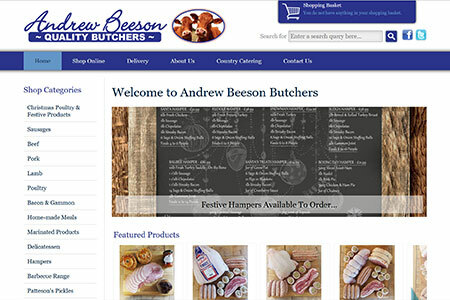 This is a bespoke ecommerce online shop that I built for a family run Butchers. They sell goods online and deliver the orders to there customers to England, Wales and Scotland. The site allows users to view products by category or search using the search box in the header. They also provide a Hog Roast service, for which details can be found on a seperate website. This site is linked to from the Butchers "Country Catering" link.